In Rio Grande City, an inn called LaBorde House wears its old age with elegance. Built in 1899 by merchant François LaBorde, who operated his business downstairs while his family lived above, the building evolved after François’ death into a boardinghouse run by his widow. The house later operated as a hotel and a bus station, and legend says it served as home base for Prohibition-era smugglers, who imported bootleg liquor via a brick tunnel running down to the Rio Grande. R.C. Salinas, who guides town tours these days, can’t refute or confirm these rumors, but he points out another tricky LaBorde mystery: The inn doesn’t officially claim any ghosts, but guests staying in one particular upstairs room often hear doors slamming inexplicably. LaBorde House has been restored to its original Victorian-era authenticity, from its old-fashioned parlor to its seven large, distinctive bedrooms. The inn’s charm shows in its canopied and fourposter beds, polished wood floors, marble-topped dressers, 14-foot ceilings, and hand-carved wooden balusters edging the staircase. Prints depicting regional wildlife by John James Audubon and his son John Woodhouse, who visited the Texas Gulf Coast in the 1800s, decorate the walls. 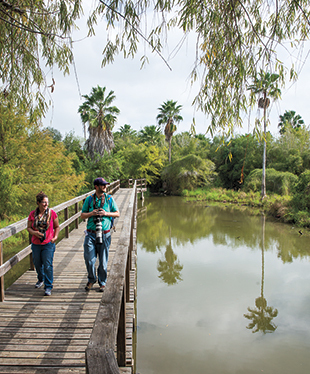 Despite its proximity to US 83, which splits as it passes through Rio Grande City, the LaBorde still maintains its regal countenance, its verandas and secluded patio shaded by banana trees and colorful bougainvillea. Listed in the National Register of Historic Places, the inn has been a romantic venue for weddings and parties since its 1982 restoration.